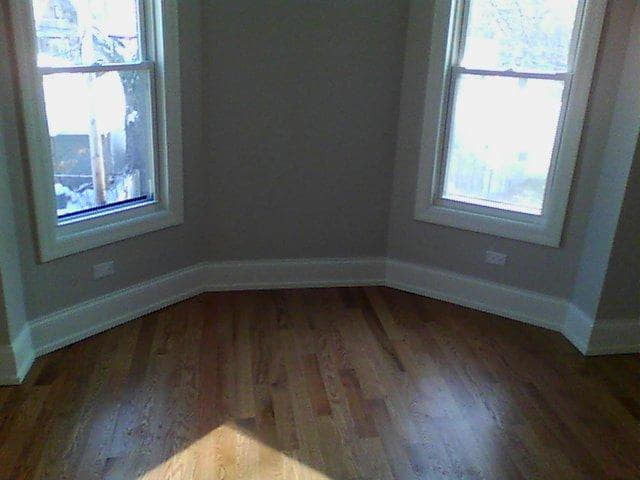 February 2019 | Chicagoland Home Inspectors Inc. The section bolded above means to me that I will remove the dead front of all electrical panels and sub-panels so I can visibly inspect the interior components, conductors, and overcorrect protection devices. When I run into Federal Pacific Electric (FPE) panels I do not remove the dead front of these panels. There are provisions in the Illinois law that allow home inspectors to not comply with the standards if they feel the actions are dangerous. I will say it. I am afraid of these panels. I think they are dangerous. I believe that they should be removed and upgraded to new panels as soon as possible. I believe that if I disturb the panel in any way, I can make something that I already consider bad, worse. I don’t want to damage anyone’s home, or even worse, cause injury or death to someone. So why the heck am I so afraid of these panels? We have all heard stories about breakers falling out and just hanging by the wires when the cover panel is removed. Some inspectors say that this is an old wives tale. Well if it is an old wives tale, then I am the old wife. I am the guy who had these breakers fall out as soon as I took that panel off. My heart stopped, my jaw dropped, and I didn’t know what to do. I couldn’t just leave the breakers hanging like this. I tried to put the breakers back in their proper position and they just kept falling out because they were loose and hardly made contact with the panel. It got to the point where I got the breakers back into position, held them there with my hand, took the panel cover with my other hand, covered the panel with my hand under the cover and then I did a magician’s trick and slid my hand out from under the cover so I can jamb the panel back on to hold the breakers in place with the cover panel. The layout of this panel did not make it easy to accomplish this in one try. I decided that that was one of the dumbest things that I have ever done in my life, and I will never do it again. 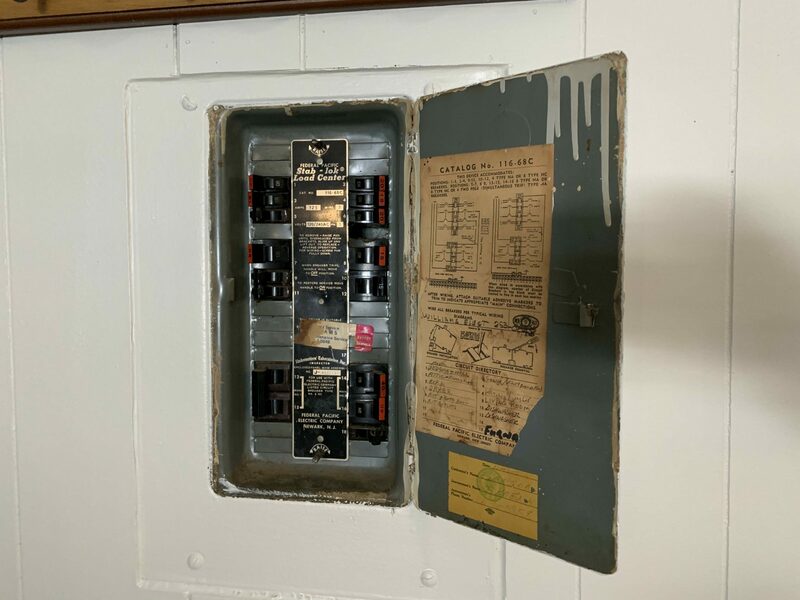 Federal Pacific Electric (FPE) panels were one of the most common, if not the most common electrical panel sold in the United States from the 50’s through the 80’s. They were inexpensive, UL approved, and many electricians installed them in homes across the country. House fires happen. When they do, it is the job of the fire department to determine the cause and origin of the fire. It started becoming a common occurrence that the point of origin was the electric panel and that electric panel was manufactured by FPE. UL and electrical experts found the flaws in the panels (more specifically the breakers) and removed the UL listing. There was no mandated order to remove any existing FPE panel. I still run into these stab-loc panels today. 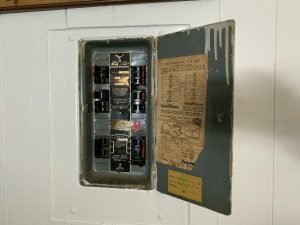 I firmly believe that even though these have been working for at least 40 years without any signs of any damage to the panel or the home, they are still dangerous and should be removed. A New Jersey Court found that FPE violated the Consumer Fraud Act because FPE knowingly and purposefully distributed circuit breakers which were not tested to meet UL standards. 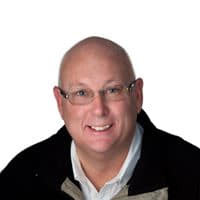 Kudos are given to Dan Friedman, a home inspector in New York, for the amount of research he has done on this subject and many other subjects (To see the Class Action Settlement Notice issued for New Jersey Residents, click here). So yes I (and everyone from our company) will recommend that these panels be removed and replaced by a professional electrician. There is no need to go into a panel when I already feel the panel is unsafe because this company committed consumer fraud and did not test their breakers to meet the minimum safety standards of Underwriters Laboratories. 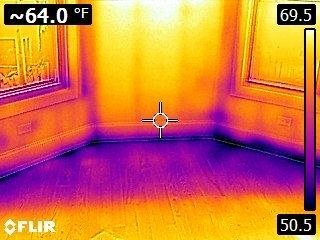 The above photos are showing poor insulation in the floor that overhangs the exterior wall. The darker the color = the colder the surface. This is common when batt insulation is just stuffed into an area. Voids are present that allow heat/cold to pass easily. The temperature change is not just a discomfort. It can lead to condensation, mold and wood rot. I am a big fan of foam insulation. It fills most gaps and creates an excellent heat barrier. 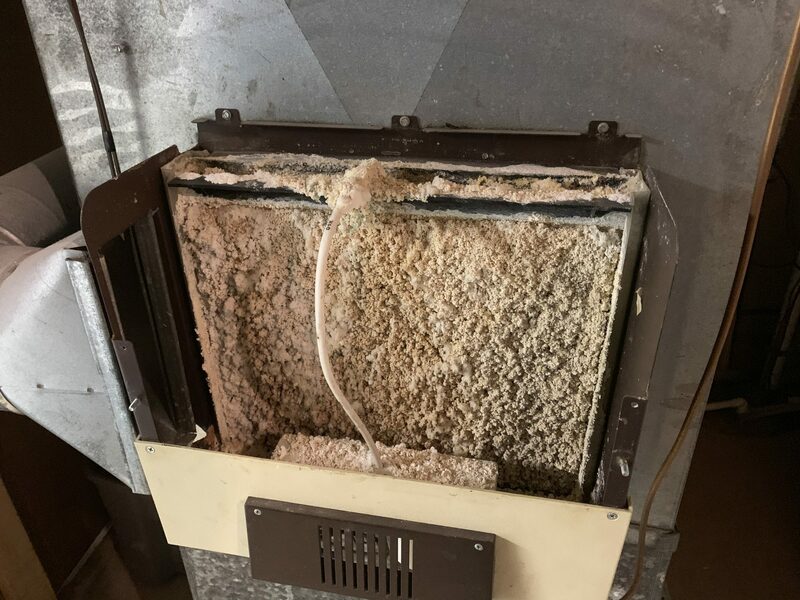 High efficiency furnaces can take combustion air from inside the house. Providing the room is large enough and the home is not hermetically sealed (or too tight). New construction home here in the Chicagoland area require blower door tests to ensure the home is air tight, but not too air tight. We have to have fresh air/oxygen so we don’t get sick. The opening on this intake does not have an elbow on it. 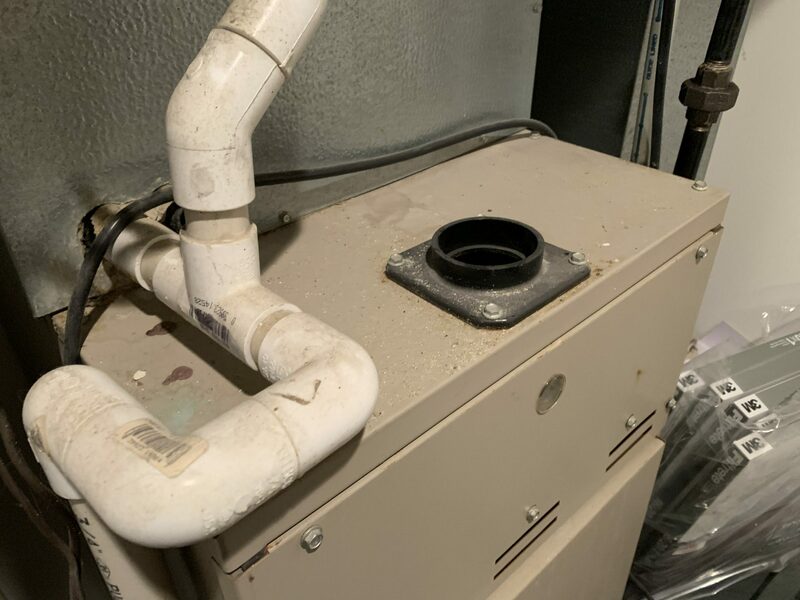 If you open any furnace installation manual, you will find the acceptable installation method so you can take combustion air from the inside of the home. 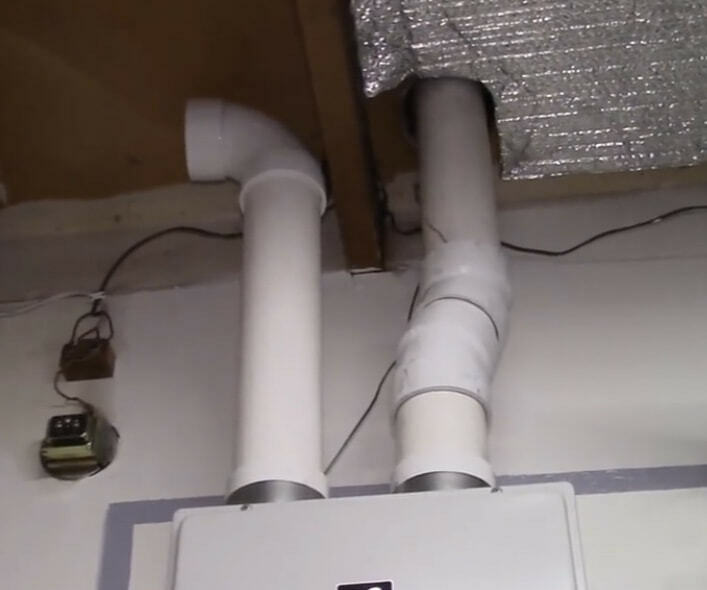 The phot below shows the proper installation method. The elbow helps prevent inadvertent blockage such as resting clothes, towels, books, or boxes on the hole. Blocking this opening should stop the furnace from starting but should it start, the oxygen will be limited and high levels of carbon monoxide will be created. 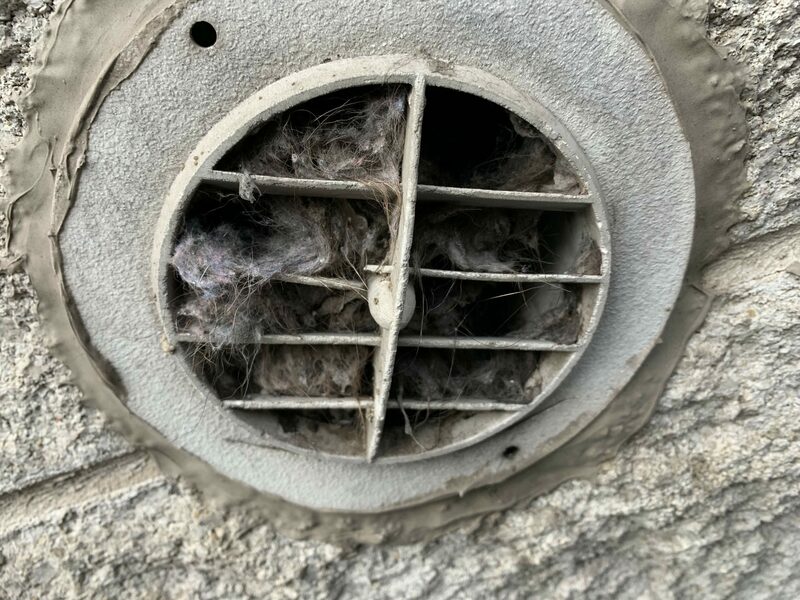 A home inspection in Lake View found a clogged dryer vent. Keeping these clean is important. 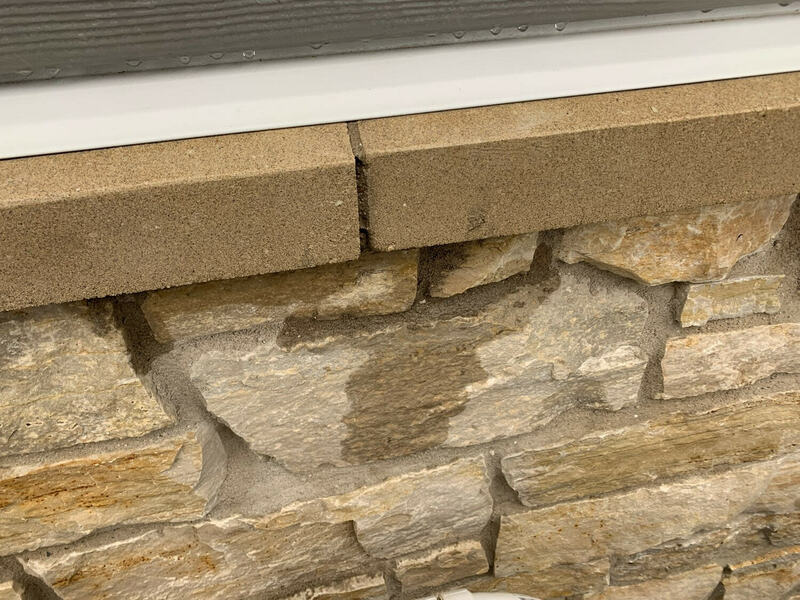 A Northbrook Home Inspection (New Construction), we found a missing mortar joint. It may not seem like much, until the stone comes loose and needs to be repaired. 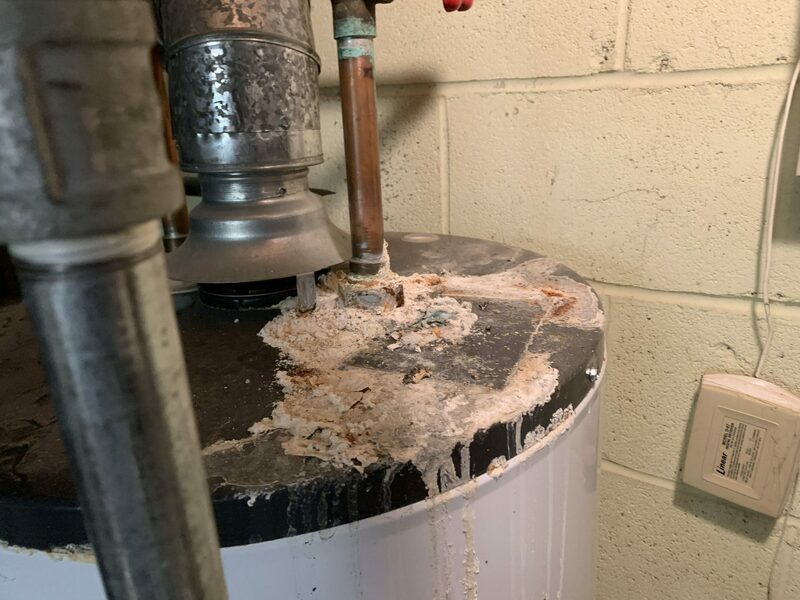 A Home Inspection in Rogers Park – Chicago found this water heater. During a home inspection in Lincoln Square -Chicago we opened this humidifier and found the winner. Can anyone top this?